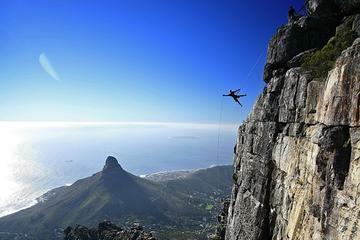 Safely launch yourself off Cape Town’s most famous attraction, the awe-inspiring Table Mountian. This adventure is one you will never forget, with Table Mountain’s unrivalled natural beauty combining with the excitement of abseiling off a sheer cliff securing this wonderful memory forever. Experience this adventure with Vlogger Jessica Ricketts in her video below. 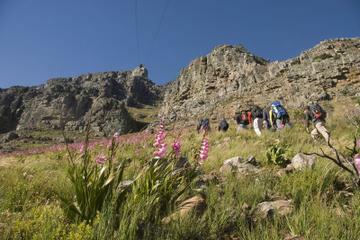 Your adventure will begin at the cable station, below the towering Table Mountain. Here you may choose to either hike or take the cable car to the summit. We suggest that only the fit and healthy hike. The trails can be strenuous. 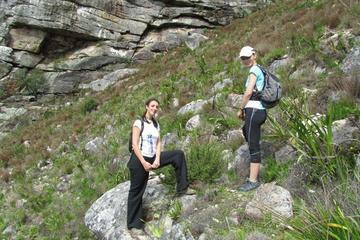 If you do choose to hike, for the purposes of the activity stick to either Platteklip Gorge Trail or India Vensters trial. Both these trails are beautiful, but the India Venster trail is the most impressive. It does, however, require mild climbing and is more difficult. This trail is for experienced hikers. You also have the option of hiking one way and walking the other. 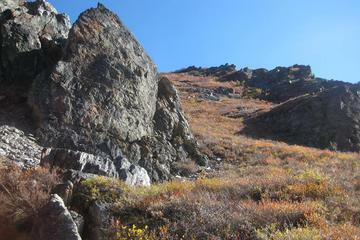 Keep in mind that it is more rewarding to hike up the mountain. Once you have reached the summit, you will arrive at your destination, the world’s highest abseiling spot, commercial that is. Here you will undertake a brilliantly beautiful 112m abseil. This controlled descent is guaranteed to get your blood pumping. You are then free to make your way down the mountain. Please be sure to take your time to appreciate the views throughout the trip. You will be in one of the most beautiful places in the world. It was the perfect way to experience Table Mountain Jacob and Patrick were completely engaged in the experience from beginning to end offering knowledge and encouragement to all! Fantastic Hike up Skeleton Gorge! Cliff was a fantastic Guide, friendly, knowledgeable and always willing to share his experiences. We had a warm sunny day and the hike although a little strenuous was well worth the effort, as we had fantastic views during the hike and from the top of Table Mountain. Cliff took us on a less familiar route and we seen things that we wouldn't have, had we followed the normal route. My wife and I both thoroughly enjoyed the Hike and met our expectations to the full. We have some great pictures and memories to take back to Scotland with us. Fantastic hiking activity, well planned along with a great guide (OTC) I had a wonderful time doing the hike. Cliff from OTC is an accomplished, fantastic guide with a main concern about safety of the hikers. He took good care of me, showed the tricky areas of the trail, and the day was a perfect hiking activity full of beautiful, wonderful views from the marvellous city of Cape Town. I plan to return to South Africa, and definitely I plan to do the hiking again along with some friends; but definitely I would book the hiking tour with GET YOUR GUIDE but I would request Cliff as our guide. He is synonym of safety and enjoyment during the activity. Thank you Get Your Guide and Cliff from OTC for such delightful day of hiking. Perfekter Aufstieg Wir wurden direkt an unserem Hotel abgeholt und zum Tafelberg gefahren. Unsere Wanderung begann in der Nähe der Talstation der Seilbahn und führte uns auf die Spitze des Tafelbergs. Wir haben etwas über drei Stunden nach oben gebraucht. Der Weg war steil und nicht zu unterschätzen, aber auch ohne Bergwandererfshrungen gut zu meistern. Unser Guide Reinhard war super. Wir haben extrem viel Spaß gehabt und würden die Tour jederzeit wieder machen. Veelzijdig, proffesioneel, onderhoudende gids Prima gids. Paste zich volledig aan aan onze wensen. De gids was heel vriendelijk, met veel kennis, open voor alle vragen, correct. Onze beste dag in Kaapstad ! Absolutely amazing! I could not recommend this highly enough. As a solo traveller in Cape Town I wanted an experience that made me feel safe with someone who really knew the area – and Stuart was the perfect person for the job! I underestimated the climb – but was damn proud at the end of completing it and Stuart could not have been more encouraging. The only way to see Table Mountain in it's full glory in my opinion! Perfect Experience. My Smile grown up from the Start until the end of the route. Stuart pushed us to the top of the Table Mountain :). He Takes Time to explain many Details on the way above. Absolutly a Nice guy! Thank you for this good day. Lynette was a perfect guide. The tour was interesting, she cared about every persons skills and fitness level, gave us a lot of informations, was very friendly and made the tour very personal! Our hike up with Cliff was truly an unforgettable experience! He has a vast knowledge of the history/fauna of the landscape and would share this when we stopped to catch our breaths and admire the views. His enthusiasm to share his love of the outdoors was infectious and we laughed/sang and scrambled our way to the top! We cannot recommend him enough and can’t wait to visit again for a longer hike! Cliff was the perfect guide. 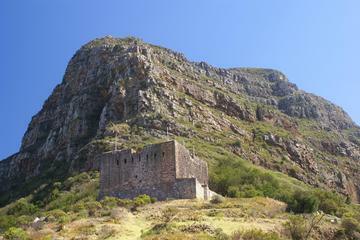 He knew all about the history of Capetown and Tablemountain. He told us about the fauna and flora, he showed us the nicest photo places, he was wel prepared for everything (even for the unexpected rain). Ein Wort geht nicht besser : perfekt ! Had a fantastic hike to the top of Table Mountain. Nathan was a great guide. He was very accommodating and was well-informed about the trails in Cape Town. He was in direct communication with me before the hike so that I knew what to expect, which I appreciated. I’ve been to Cape Town 4 times previously but never had time to organize my hike of Table Mountain. I finally made time during this trip and was in awe!! Such an amazing hike, great challenge, with awesome views. My guide, Nombulelo, was the best ever!!! She provided excellent instructions and facts along the way. She always took time to accompany me to visit a local vineyard for lunch after the hike. Great conversation along such a scenic path from the gardens. Highly recommend!! I was travelling alone and had a great time hiking up Tabletop mountain. The local tour guide ‘Skeezo’ of local tour operator Bike and Saddle Cape Town was really good company. It was his first time too in fact like for me too, but he seems to know what he was doing. Because it was my first hike ever, he managed the pace for me and took some mini-breaks along the way to the summit via Platteklip Gorge path. I had bad luck with the weather cloudy morning, misty at summit, so couldn’t see the whole Cape Town landscape beyond the summit. Because of the bad weather the cable car wasn’t operating so i climbed back down again via the same path. All in all it was a great experience! This is a 5 star experience! 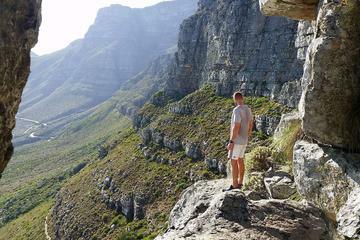 Hiking Table Mountain is one of the greatest things I’ve done.